We conducted a factorial simulation experiment to analyze the relative importance of movement pattern, boundary-crossing probability, and mortality in habitat and matrix on population density, and its dependency on habitat fragmentation, as well as inter-patch distance. 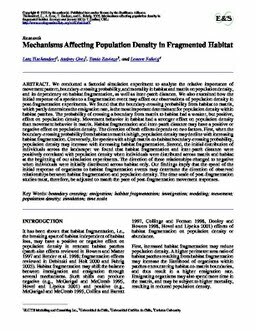 We also examined how the initial response of a species to a fragmentation event may affect our observations of population density in post-fragmentation experiments. We found that the boundary-crossing probability from habitat to matrix, which partly determines the emigration rate, is the most important determinant for population density within habitat patches. The probability of crossing a boundary from matrix to habitat had a weaker, but positive, effect on population density. Movement behavior in habitat had a stronger effect on population density than movement behavior in matrix. Habitat fragmentation and inter-patch distance may have a positive or negative effect on population density. The direction of both effects depends on two factors. First, when the boundary-crossing probability from habitat to matrix is high, population density may decline with increasing habitat fragmentation. Conversely, for species with a high matrix-to-habitat boundary-crossing probability, population density may increase with increasing habitat fragmentation. Second, the initial distribution of individuals across the landscape: we found that habitat fragmentation and inter-patch distance were positively correlated with population density when individuals were distributed across matrix and habitat at the beginning of our simulation experiments. The direction of these relationships changed to negative when individuals were initially distributed across habitat only. Our findings imply that the speed of the initial response of organisms to habitat fragmentation events may determine the direction of observed relationships between habitat fragmentation and population density. The time scale of post-fragmentation studies must, therefore, be adjusted to match the pace of post-fragmentation movement responses. Tischendorf, L. (Lutz), Grez, A. (Audrey), Zaviezo, T. (Tania), & Fahrig, L. (2005). Mechanisms affecting population density in fragmented habitat. Ecology and Society, 10(1).